Features. 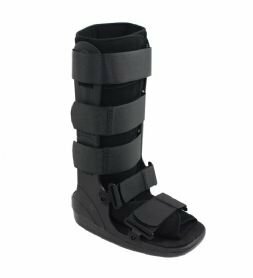 Perfect for soft tissue injuries grade 2 and 3 sprains stable fractures and post-operative use.. Specially-designed rocker bottom is low-profile promoting a natural stable gait.. Shock absorbing sole minimizes impact on the heel while walking preventing further injury.. Fits left or right foot.. High Top. Specially-designed rocker bottom is low-profile, promoting a natural, stable gait. Shock absorbing sole minimizes impact on the heel while walking, preventing further injury.